Meals for Mutts Natural Organic Conditioner is an ideal natural formula for dogs with sensitive skin and allergies. The organic conditioner leaves a relaxing and soothing effect. It hydrates and makes the fur smooth. 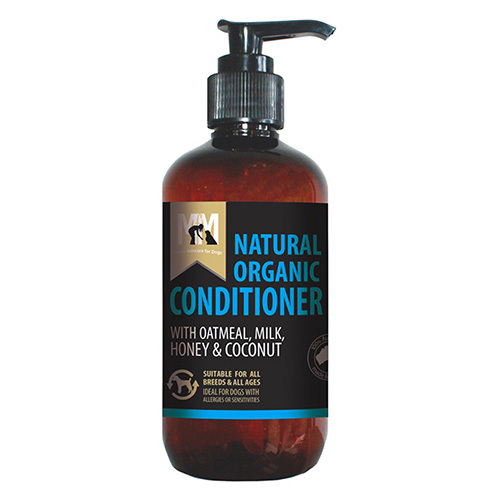 MFM organic conditioner is made of a unique blend of milk, honey and coconut. The conditioner penetrates the hair shaft and restores shine while strengthening your dog’s fur. The added benefits of certified organic extracts and 100% pure therapeutic grade essential oils relaxes your dog and vitamin B-12 and E relieves your dog from itching. MFM grooming product is especially helpful for sensitive and irritated skin. Apply a small amount of Natural Organic shampoo to your hands and then work into the coat and create a cleansing lather. Rinse thoroughly and apply Natural Organic conditioner. Rinse thoroughly and towel dry if necessary. Do not allow conditioner to get into your dog’s eyes.